Prolific Japanese architecture firm Kengo Kuma and Associates recently worked its magic in the tiny Swiss village of Montricher at the foot of the Jura Mountains. There, the architects designed a contemporary family home that’s partly suspended from an existing concrete canopy and wrapped with timber inside and out. Created for the Jan Michalski Foundation, the cocoon-like dwelling — named Suspended Forest — is meant to further the organization’s mission of fostering literary creation and the practice of reading. Set close to the forest, the 120-square-meter abode takes inspiration from its nearby surroundings with an abundant use of timber. The architects collaborated with a local craftsman for the roof and facade system, which combines traditional techniques with contemporary style. Using locally sourced oak and larch, the architects cut out rectangular shingles of varying sizes and arranged them in a checkered pattern with an organic and random appearance to create an eye-catching exterior that doubles as a screen. 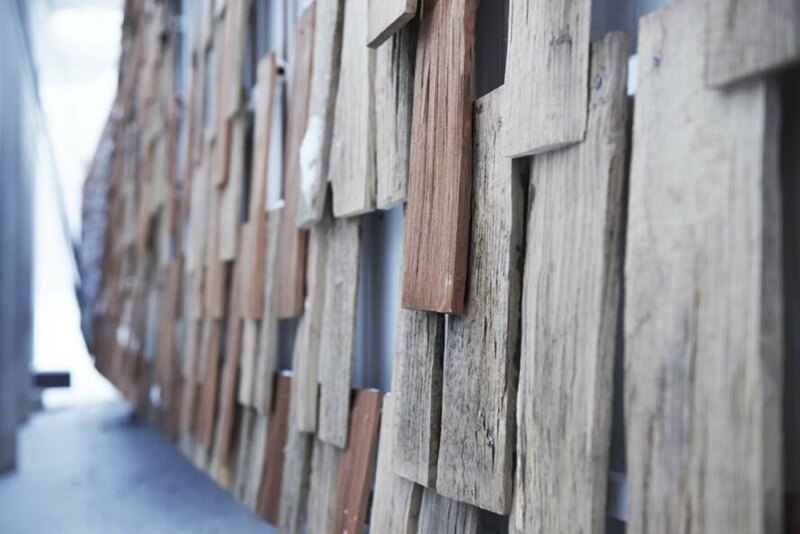 The wood was left untreated so as to develop a natural patina over time. An outdoor staircase, also suspended off of the main building, leads to the entrance, which opens up to a long hallway branching off to the home office, bedroom, technical room, master bedroom and finally the living area in the rear. 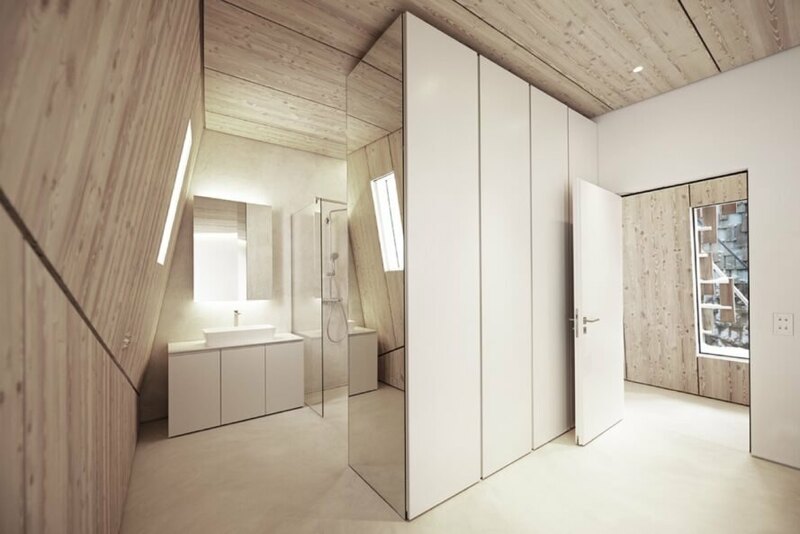 The cocoon-like sensation created by the exterior cladding is echoed in the interior through the use of angular larch panels covering the ceilings and walls. Large windows let in plenty of natural light and views of the outdoors. 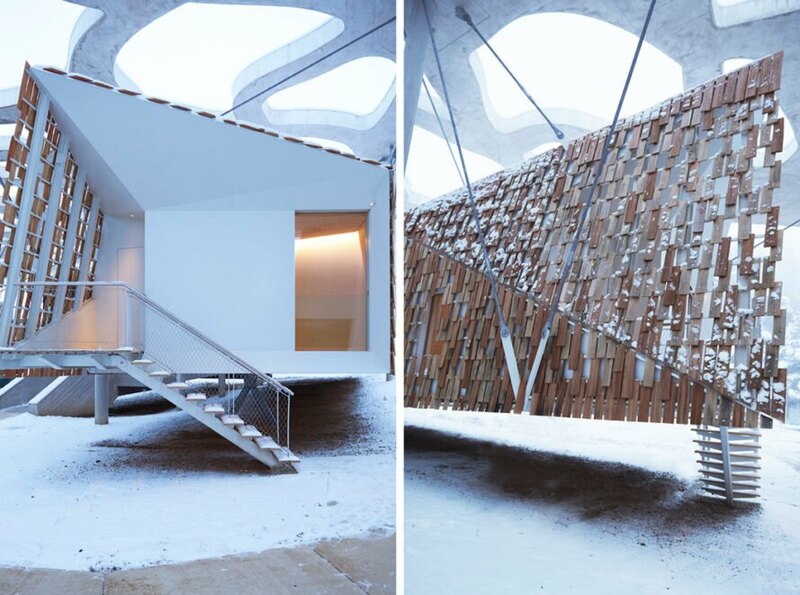 Kengo Kuma designed this cocoon-like structure for the Jan Michalski Foundation. The dwelling is designed to further the organization's mission to foster literary creation and reading. 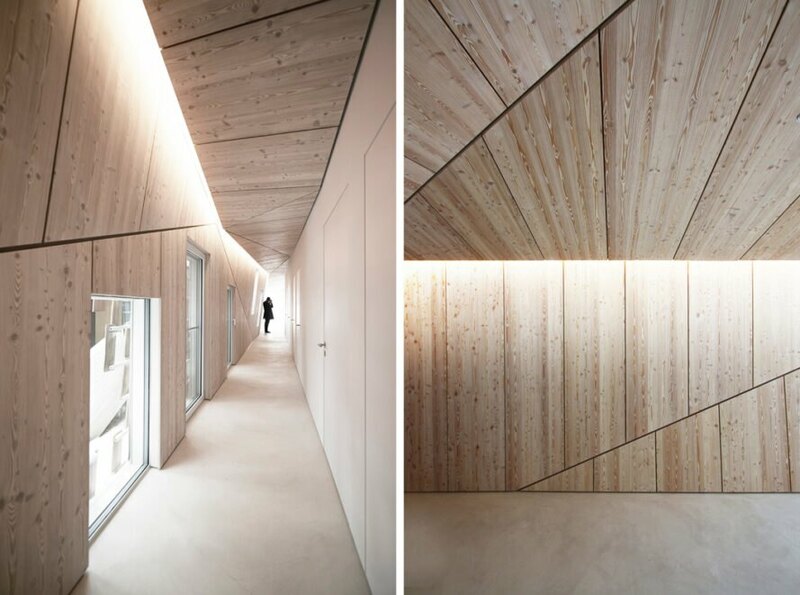 The roof and facade is created from untreated, locally sourced wood. 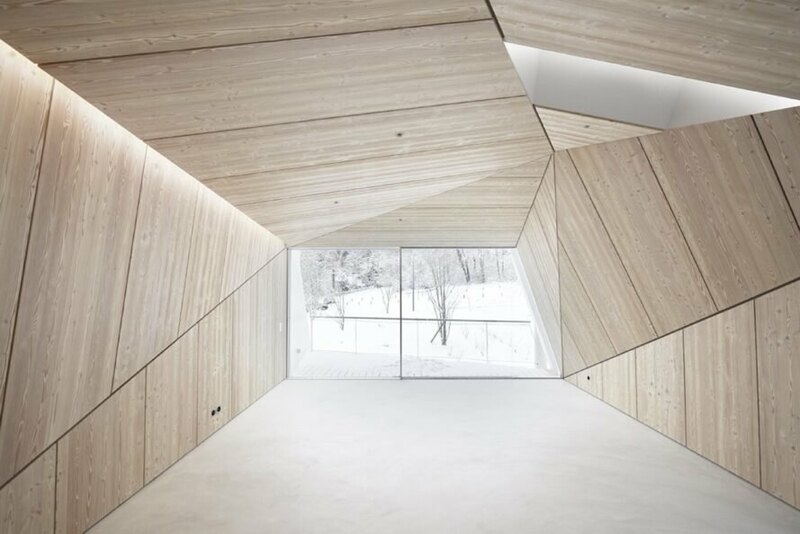 Inside, geometric shapes create a striking appearance. Recessed lighting complements the natural light that streams in. The structure is lined with wood inside and out. 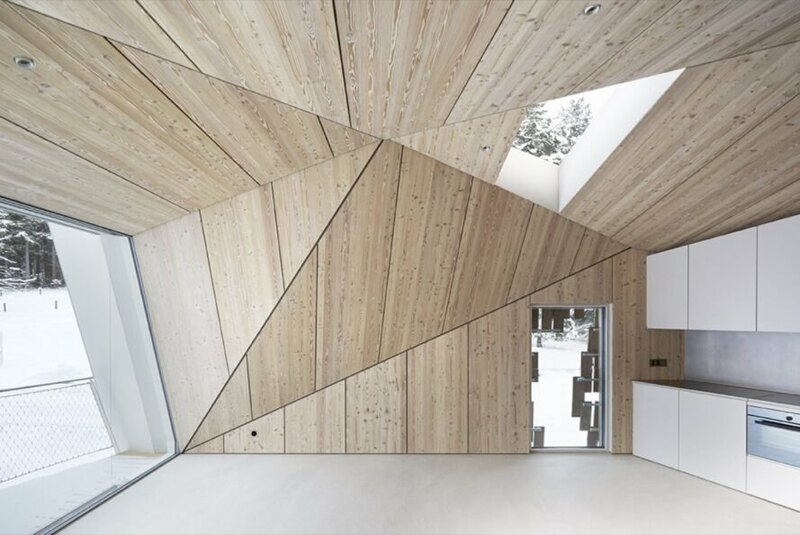 Angular larch panels create a playful design. Sunlight and stunning views are welcomed inside.